"I evaluate the specific legal issues, risks and hurdles my clients face, while trying to keep their wider corporate and business goals in mind." Erin Carroll helps entrepreneurs, high-growth companies and private equity firms successfully complete mergers and acquisitions, private equity transactions and investments. Erin Carroll has a range of both company and investment-side representation, as well as both private and public company experience. Her work has ranged in size from large M&A, Capital Markets and Emerging Company transactions, often involving over $100 million in consideration, to restructuring a 501(c)(3)’s corporate governance documents on a pro-bono basis.She enjoys acting as a strategic partner for her clients, providing ongoing corporate counsel and crafting creative solutions to legal problems, both large and small. Her genuine interest in people, natural curiosity about the businesses her clients run, and life-long love of both learning and problem solving—combined with an intense attention to detail—make her a successful advocate for her clients. Erin joined the Feinberg Hanson team in August, 2018. 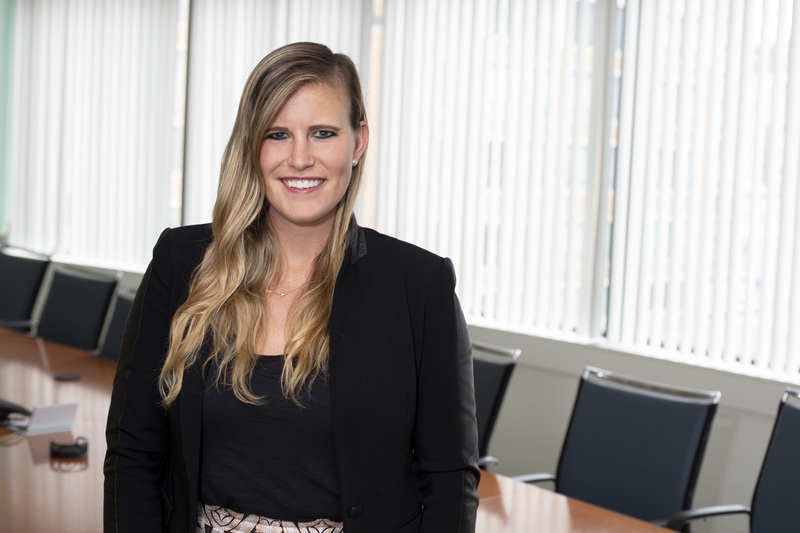 Prior to joining Feinberg Hanson LLP, Erin had been an associate in the corporate department of Latham & Watkins LLP’s Boston office, where she focused mainly on Life Sciences and emerging technology clients. Erin has been admitted to the New York and Massachusetts bars. Radius Health, Inc. (NASDAQ: RDUS), in connection with its public follow-on equity offering of 4,600,000 shares of its common stock at a public offering price of $36.75 per share, representing an offering size of $169,050,000 in the aggregate. HeartWare International, Inc. (NASDAQ: HTWR) (which was subsequently purchased by Medtronic Plc (NYSE: MDT)), in its public cross-border acquisition of Valtech Cardio, Ltd, an Israel-based medical device company, for consideration and payments including: $368,412,000 consideration at the closing of the acquisition; $125,595,000 contingent consideration, upon Valtech’s hitting certain regulatory approval milestones with respect to its products; and $375,000,000 earn-out payments, upon Valtech’s hitting certain sales revenue milestones for such products. Monsanto Company (NYSE: MON), in connection with the renegotiation and amendment of its combined equity investment and option transactions with Preceres LLC, a company that is researching novel approaches to biological pest, virus and weed control. This transaction involved renegotiation and amendments with respect to a complex series of staged equity investments tied to milestones, combined with a purchase option and service agreements. Boston Scientific Corporation (NYSE: BSX), in connection with its $65,000,000 acquisition of IoGyn, Inc. and other strategic investments and acquisitions. Kiniksa Pharmaceuticals Ltd. (NASDAQ: KNSA), in connection with its cross-border formation (in Bermuda and the United States, respectively) and its $40,000,000 Series A financing. First Aid Beauty, Limited, in connection with an investment made by Castanea Partners, a Boston-based private equity firm. Great Hill Partners, a Boston-based private equity firm, in connection with its acquisition of YogaWorks, a Los Angeles-based leading provider of progressive and quality yoga, with 29 studios across four markets. Palladin Consumer Retail Partners, LLC, a Boston-based private equity firm, in connection with its acquisition of a majority interest in Harry’s of London, a London-based luxury shoemaker and accessories house. Morgan Stanley & Co. LLC, Credit Suisse Securities (USA) LLC, UBS Securities LLC and Nomura Securities International, Inc., as designated underwriters’ counsel, in connection with the initial public offering of Akebia Therapeutics, Inc. (NASDAQ: AKBA), in which the underwriters purchased 6,762,000 shares of common stock at a public offering price of $17.00 per share, representing an IPO size of $114,954,000 in the aggregate. UBS Securities LLC, Morgan Stanley & Co. LLC, JMP Securities LLC, Needham & Company, LLC and Brean Capital, LLC, as designated underwriters’ counsel, in connection with a public follow-on equity offering by Akebia Therapeutics, Inc. (NASDAQ: AKBA), in which the underwriters purchased 8,363,636 shares of common stock at a public offering price of $8.25 per share, representing an offering size of $68,999,997 in the aggregate. This follow-on offering was pursuant to a shelf registration statement filed with the SEC on Form S-3, under which Akebia Therapeutics, Inc. had registered shelf offerings of up to $160,000,000 worth of its common stock. RBC Capital Markets, LLC, William Blair & Company, L.L.C., Cantor Fitzgerald & Co. and Janney Montgomery Scott LLC, as designated underwriters’ counsel, in connection with the initial public offering of Agile Therapeutics, Inc. (NASDAQ: AGRX), in which the underwriters purchased 9,166,667 shares of common stock at a public offering price of $6.00 per share, representing an IPO size of $55,000,02 in the aggregate. William Blair & Company, L.L.C., RBC Capital Markets, LLC, Janney Montgomery Scott LLC and Cantor Fitzgerald & Co., as designated underwriters’ counsel, in connection with a public follow-on equity offering of Agile Therapeutics, Inc. (NASDAQ: AGRX), in which the underwriters purchased 5,511,812 shares of common stock at a public offering price of $6.35 per share, representing an offering size of $35,000,06 in the aggregate. Aratana Therapeutics, Inc. (NASDAQ: PETX), in connection with its public follow-on equity offering of up to 6,325,000 shares of its common stock at a public offering price of $19.00 per share, representing a maximum offering size of $120,175,000 in the aggregate.